This is our second attempt at the image, for the reshoot we increased the focal length to 170mm for more detail. This is the largest spherical gigapixel we have produced so far, it certainly pushed Peter and the computer to it’s limits with a 60GB psb file. Many days have been spent working on the image. The rendered image produced from 1082 photos is in total 218296 x 109148 pixels, which is just under 24 gigapixels. 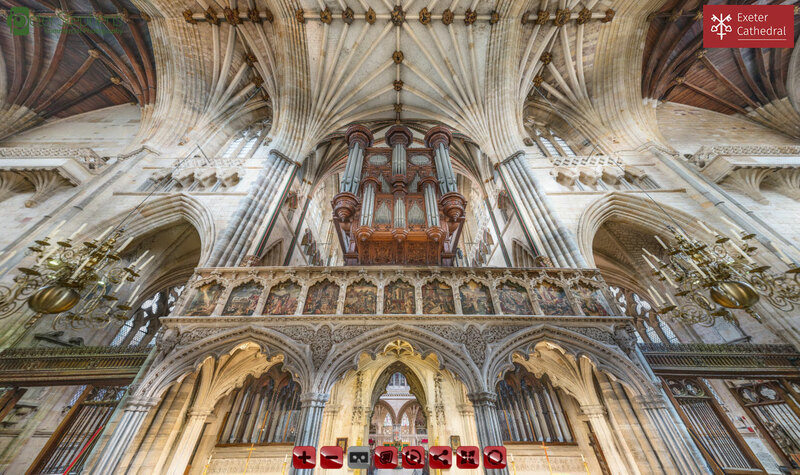 The Virtual Tour of Exeter Cathedral has a few new 360vr image which are added to existing scenes from the top of the two towers, the Nave without any of its furniture and Chapter House with its stunning ceiling. The tour has been produced from images produced on various visits between 2007 and 2017. Images are varied in quality, some of the older images will be updated in time.